FC Barcelona is the first sports club in the world to reach three million subscribers on their YouTube channel. Barça are ahead of large sporting competitions like the NFL, the Olympics, LaLiga and the Bundesliga except for the NBA and they are also in front of the top football teams in the world. FC Barcelona pioneering use of YouTube started eleven years ago and since then it has always been a leader in the use of the video sharing platform. The Club’s support has grown spectacularly in the last year. More than 670,000 new subscribers have joined in the last 365 days and, in this time, 420 million hours of content has been watched. The week of the historic comeback against PSG (6-1) saw 69,000 new fans join in seven days and the most watched content of the year was the players’ celebrations on the pitch following Sergi Roberto’s goal. From the biggest football clubs with a YouTube presence, Barça have a healthy lead over their competitors: Real Madrid (2,369,459), Manchester City (892,573), Bayern Munich (694,450), Arsenal (627,723) and Chelsea (627,674). The Club’s focus on entertainment, fun, the squad, the legends and regular content have been key to Barça’s success on the main platform for videos in the world. The content in the series ‘Barça & Emojis’, which has over 6.5 million views, is a clear example of this winning combination and is closely followed by the 360º videos and the live streamings. 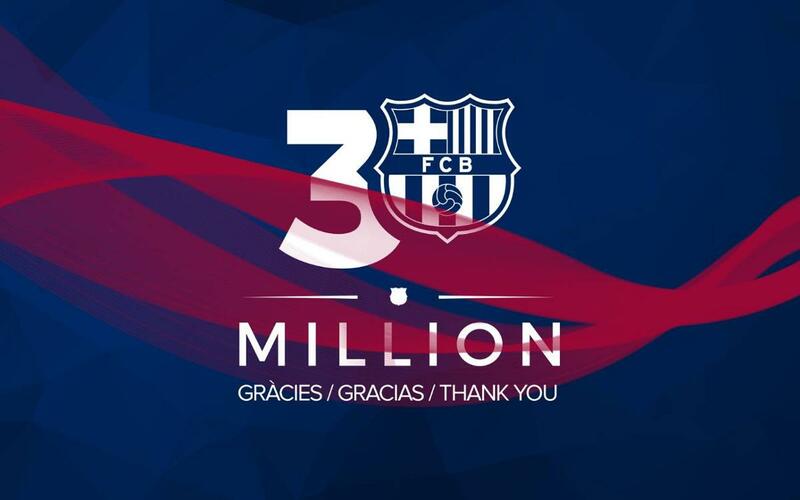 The milestone of three million followers reinforces Barça’s digital leadership once more. In 2017, the Club has reached landmark figures on other social media sites. For instance, they surpassed the 100 million mark on Facebook and were the first sports club to have over 50 million followers on Instagram.